Sturdy steel construction and replaceable poles make this 120"L x 2-3/4" dia. fork mount rug ram/carpet lift an excellent choice. Poles are rotatable and have tapered tips for ease of loading materials. Featuring 7-1/2"W x 2-1/2"H fork pockets on 24" centers and safety restraints, this lift eases the labor of moving carpet, rugs, and other materials on rolls. Uniform capacity: 2200 lbs. Finish: painted blue. Size: 120"L x 2-3/4" dia. WARNING: This product may expose you to chemicals which are known to the State of California to cause cancer and reproductive harm. For more information – www.p65warnings.ca.gov. 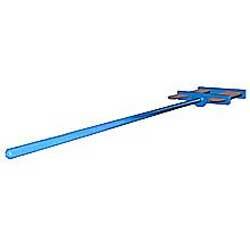 Fork Mounted Coil Ram/Lifter - 24"L, 4-1/2"Dia. Carriage Mounted Coil Ram/Lifter - 24"L, 4-1/2"Dia.